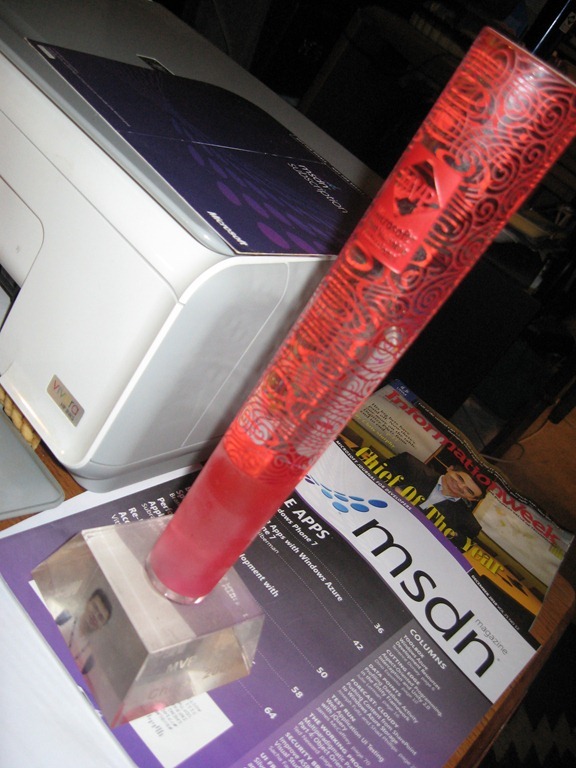 The award email is almost identical to last year’s, so I assume Microsoft would go greener and more renewable with the Microsoft MVP award program each year, maybe that’s the reason I got a frosted glass lug instead of a trophy like previous years. The dangling cards on the right are the ID badges for the last two years which are the only other award items that have my name besides the certificates. There are two lugs on the 2010 trophy for 2010 and 2011. The trophy on the left is for 2009. They look at lot cooler than my 2008 one, though you can tell it takes more effort to inscribe the 2008 trophy with my photo. 2008 is the only time the trophy come with a photo. Previously I only get trophies with my name on. Here is the box, not much inside except the certificate. The award disk is stacked on the 2010 trophy already. The lapel pin is there every year but it is hard to keep because it’s too small and I practically never wear it. The certificate is going greener too, at least the frame is becoming lighter than previous years. 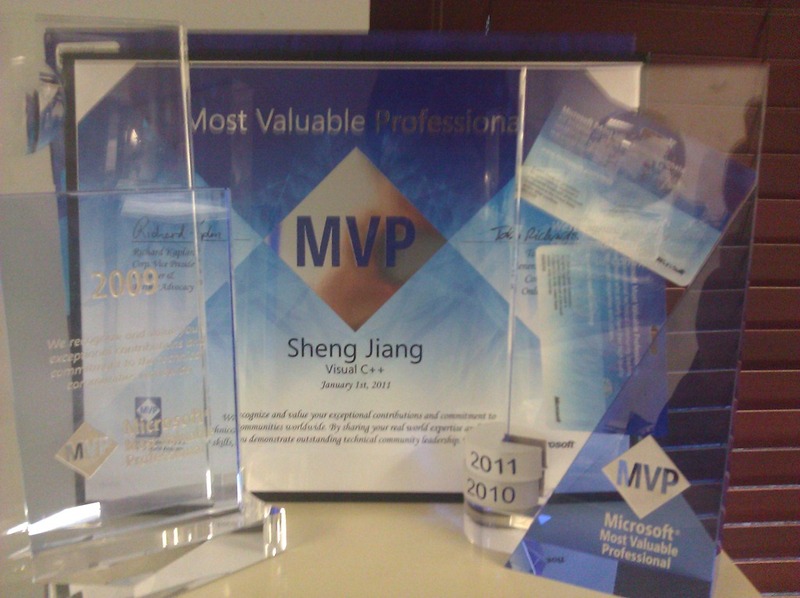 You can also see the MVP logo changed a while ago, and the whole certificate goes blue in 2009. The last time I got other stuff from Microsoft was back in 2008, when the gift package has an MVP branded Bluetooth package including USB adapter, wireless headphone and a laptop mouse that I can’t use because I don’t own a laptop. Perhaps that’s why Microsoft stopped wasting money on stuff people may not use. Now Microsoft is also asking MVPs to give back a little bit to the community this year at the Northwest Harvest Sponsored event via GeekGive. Perhaps we will be handing out food stamps at the site. 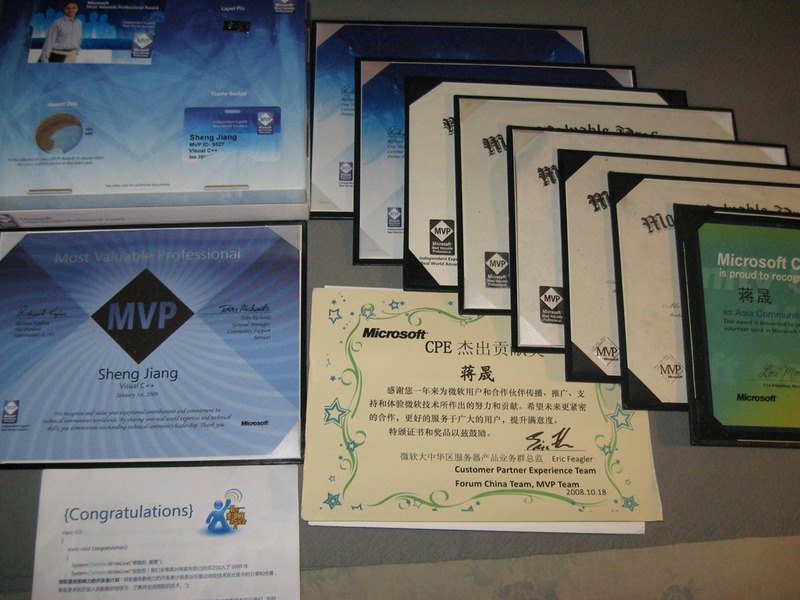 Looks like my 2008 MVP certificate is missing. The green certificate is for community star which I got back in 2003 when newsgroups were still active (ah, the good old days). The letter on the left bottom is the congratulation letter of Microsoft “Most Influential Developer” program (now called Microsoft CNTAC, I guess, though I never figured out why it was called Microsoft GDI back then). The middle yellow one is from the Microsoft Customer and Partner Experience program. I will be at the MVP Summit in Seattle next month to help shape the next version of Visual C++. That’s mostly what the summits is about these days instead of the traditional award ceremony “you rock! let’s party!” kind of thing. I am glad that Microsoft find out how to make the most out of an award ceremony. Anyway, if you have concerns and questions about Visual C++’s future, now is the time to leave your comments. This entry was posted in Microsoft, Visual C++ and tagged Microsoft, Microsoft Most Valuable Professional, MVP program, Visual C++. Bookmark the permalink. I was also an MVP at that time. Do you know who was the manufacturer of that headset. I found my old headset lying around and can’t get the driver installed. Would appreciate your help. Thanks. Well, instead of that, I need to pair the headphone with the bluetooth adapter built in to my PC (Another headphone would be connected to the earphone jack on the machine). When I try to connect to it, it fails to install the driver because it can’t find one. Do you have the manufacturer name or URL? Also, I can’t locate the leaflet that described how to pair it. Is there an initial passcode? Although I can’t find the vender’s site now, there wasn’t a driver download on the vender’s page. All the web site had for downloading was a customized version of BlueSoleil 2.0 or 3.0. To pair press both buttons (you need to time them because they go different cycles) until flashing green.